Its just a block of wood. Carved and dressed to the nines but still just a block of wood. It cant be...evil, can it? The answer to that may lie here. For years, Scarface has been one of the most brutal mobsters in the Gotham City underworld and a constant adversary of Batman. But Scarface is just a ventriloquists dummy the mannequin mouthpiece of mild-mannered Arnold Wesker. 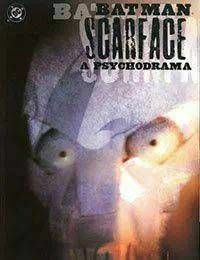 Its believed that Scarfaces savagery and disregard for human life is merely a symptom of Weskers fractured psyche. But what if that outlet were removed from the Ventriloquists possession? What if the puppet were burned, buried and left to rot? Would the evil truly disappear? As Wesker attempts a normal life -- with a new dummy assistant, the pretty but smart-mouthed Lola his ventriloquist show seems to ruffle the feathers of the Penguin, whos not amused by the new act. When Wesker, the Penguin and Batman collide in the violent conclusion, will an evil be reborn?